Turning into the stretch of the 2016 Kentucky Derby. Nyquist earned a Beyer speed figure of 103 for winning the Kentucky Derby, the highest Beyer of his career; his TimeformUS speed figure came up 123. However you measure his performance on Saturday, it was a peak, and trainer Doug O’Neill looks like a pretty smart guy for bringing his Uncle Mo colt to Churchill Downs in condition to move forward off two prep races, only one of which was around two turns. I thought Nyquist would come up short for that very reason, especially if the early pace as as strong as projected. RIGHT: Nyquist was the best two-year-old and best three-year-old. This might sound like a funny brag considering I didn’t pick him to win the race, but at 2-to-1 keying a 14-to-1 exacta I have no regrets about opposing him on top because even if I had picked him to win I still wouldn’t have won anything on the race at that price with (my actual pick) Exaggerator second. But the respect for Nyquist’s talent was clearly there. I just gambled against it trumping the rest of the group. WRONG: Picking against Nyquist. From a horseplayer perspective, it’s easy to forgive the pick against—especially considering how well Exaggerator ran—but the fact is everyone wants to pick the Derby winner, and I had my chance after having Nyquist on top all year. The winner went to post at a price of 2.30 and paid $6.60 — Nyquist’s odds were the lowest for a favorite since Point Given in 2001, and lower than the odds of the three winning favorites since 2013 — Orb’s price was 5.40 that year, California Chrome’s 2.50 in 2014, and American Pharoah’s 2.90 in 2015. He was the only true survivor of a Derby pace that completely fell apart, and Nyquist did much more than merely survive. Derby recaps: Now Nyquist has real respect as he sets out to exorcise a Triple Crown demon … Nyquist wins the Kentucky Derby … Nyquist answers call, reignites Triple Crown chase with Derby win … Nyquist stays perfect with Kentucky Derby victory. He ships to Pimlico on Monday for the Preakness. 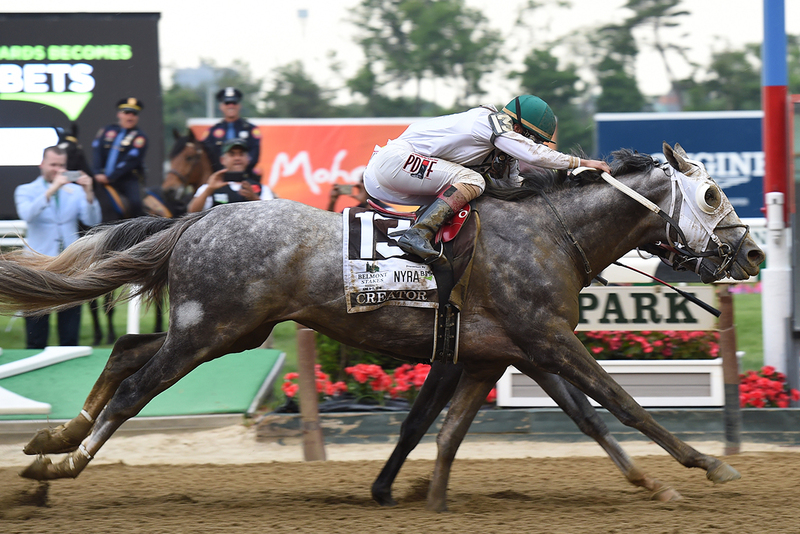 The Triple Crown winner isn’t sticking around — New York, at least. American Pharoah met the media, charmed the “TODAY” show audience, and boarded a van leaving Belmont Park around 7:30 AM, arriving back at Churchill Downs by 1:30 PM, less than 19 hours after he won the Belmont Stakes and became the 12th Triple Crown winner in American racing, the first in 37 years. The first in 37 years. Like a lot of horse racing fans, I don’t remember the last one. I’m not quite sure what to do with this one. He’s marvelous! It’s wonderful! The minutes before the race were nerve-wracking, the seconds it took him to cross the wire — 5 1/2 lengths ahead of runner-up Frosted — thrilling. There is satisfaction in discovering that a Triple Crown is still possible. The Triple Crown just needed a racehorse who could take one of the hardest things we ask a young horse to do and make it look easy. 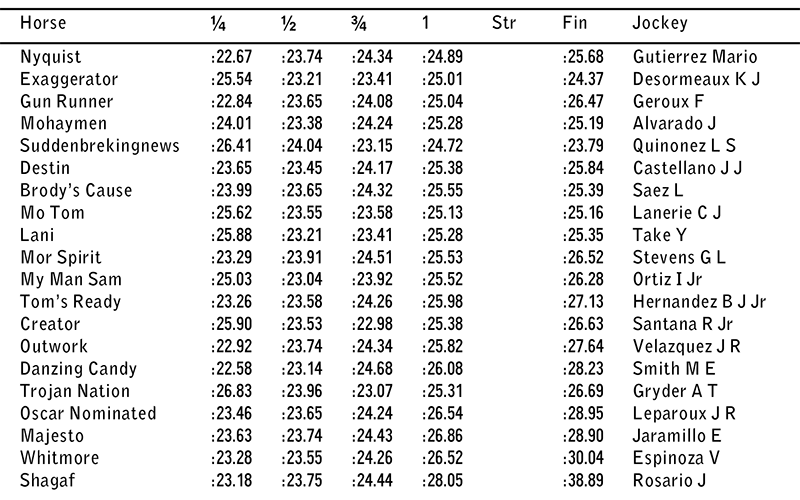 DRF incremental times above. View the official Equibase chart (PDF). He was never pushed, never threatened. Materiality, tasked with keeping the 3-5 favorite honest on the front, was out of contention before the mile. Frosted looked like a challenger at the top of the stretch — for a stride. American Pharoah gave him no ground. He was going to get away with it all. The 12th Triple Crown winner was given a Beyer speed figure of 105 for the Belmont Stakes. TimeformUS gave him a speed figure of 128. His figures are as consistent as his fractions — American Pharoah’s Preakness and Kentucky Derby Beyers were 102 and 105, his TFUS numbers 125 and 127. “After we freshen him up, we have options,” said Baffert, who mentioned the Grade 1 Haskell Invitational at Monmouth, the Grade 2 Jim Dandy and the Grade 1 Travers Stakes at Saratoga Race Course, and a “little race” at Del Mar, most likely the Grade 1 Pacific Classic. The Breeders’ Cup Classic at Keeneland is the goal for his final career start. Recaps! 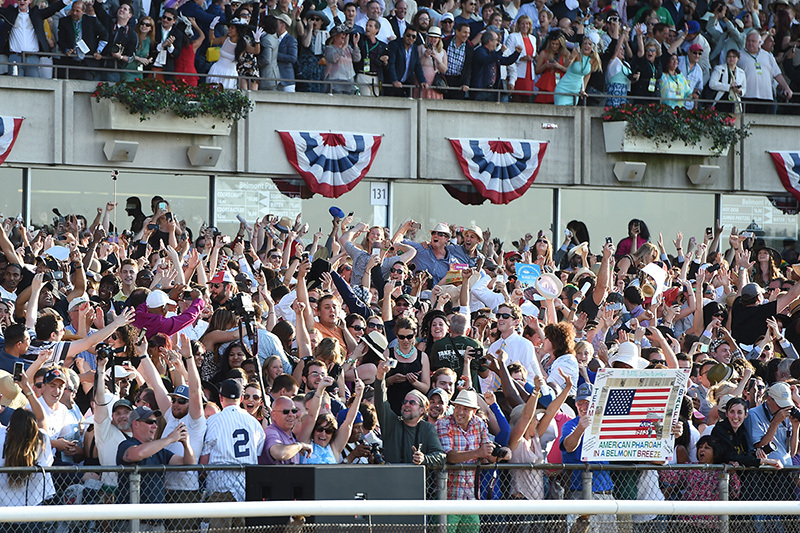 Tim Layden recounts the Belmont Stakes and the weeks before, when the word chingon became code for the confidence of the American Pharoah camp … Joe Drape captures the moment the Triple Crown became real to the 90,000 at Belmont Park … Brendan Prunty writes about the build-up. More recaps and reactions are bookmarked on this page; I’ll be adding to it.